Learn to ride with one-on-one lessons customized to your individual riding level. 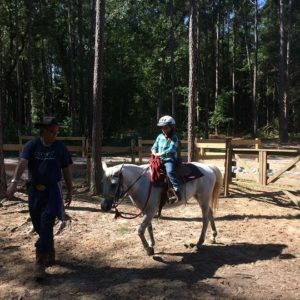 Learn to ride at the walk, trot, and canter, to stop and turn with rein and foot controls, and how to tack and untack the horse. Programs for all ages. If your horse says "no," you either asked the wrong question, or asked the question wrong. Beyond riding, learn "natural horsemanship". 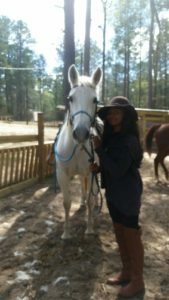 Learn how to develop a relationship built on respect, how to handle your horse safely, and beginning training techniques. Soon you will be able to "speak horse" by learning physical signals that your horse can understand. Thinking about owning a horse? Learn about care, grooming, feeding, and how to keep your horse healthy and sound. Whether you are preparing for horse ownership or fulfilling a lifetime wish to try riding a horse, we can provide customized lessons to match your needs. Lessons are available to suit your schedule, year-round, seven days a week. Learn at your own pace, using a curriculum that is customized around your goals.